Tracing Your Rural Ancestors: A Guide for Family Historians. By Jonathan Brown. Published by Pen & Sword Family History www.pen-and-sword.co.uk £12.99. US Distributor: Casemate Publishing www.casemateathena.com $24.95. Australia Distributor: Gould Genealogy, www.gould.com.au AUS$32.95 incl GST. 2011. 162 pp. Illustrations, index. Softcover. Half the population of England and Wales lived in the country in 1851 so it is going to be relatively easy to find rural ancestors on the family tree. At the same time this is a big subject with lots of options for the researcher. Mr. Brown begins by describing the largest group of rural workers, the farm laborer (1.4 million in the1851 census), looking at what they did, who specialized and who did not, and how their role changed with time. He continues examining who were the farmers, which are not easily defined or identified, and their relationships to the workers, along with a look at the landowners, their great houses and estates. Village life was affected by the different businesses, tradesmen and professionals who lived and worked in any given community, but all left different records to be searched. Another chapter looks at rural migrants and the rural poor. 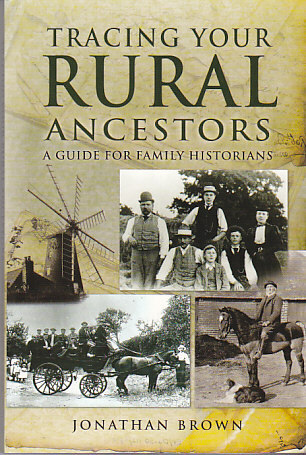 In each of these chapters suggestions are made as to what records will assist in the identifying your rural ancestors. The largest chapter consists of an alphabetical list of records and source for rural research. This annotated list identifies all the major records you would expect, but also highlights others you may not have heard of or thought of before, such as: copyhold records; enclosure records; farmers’ unions; inquisitions post mortem; rate books; terriers and more. The listing is followed by suggestions on how to identify where the records are located and how to access them, in archives, libraries and online. One word of caution is that the bibliography states that it “lists all books mentioned in the text together with other suggestions for further reading” (p.145) but this is incorrect for numerous books were recommended within the text that were not included in the bibliography. Rural ancestry is a large, many faceted topic. This book is a good introduction to the subject socially and genealogically, pointing the reader in the direction of where to find the records and more advanced readings. 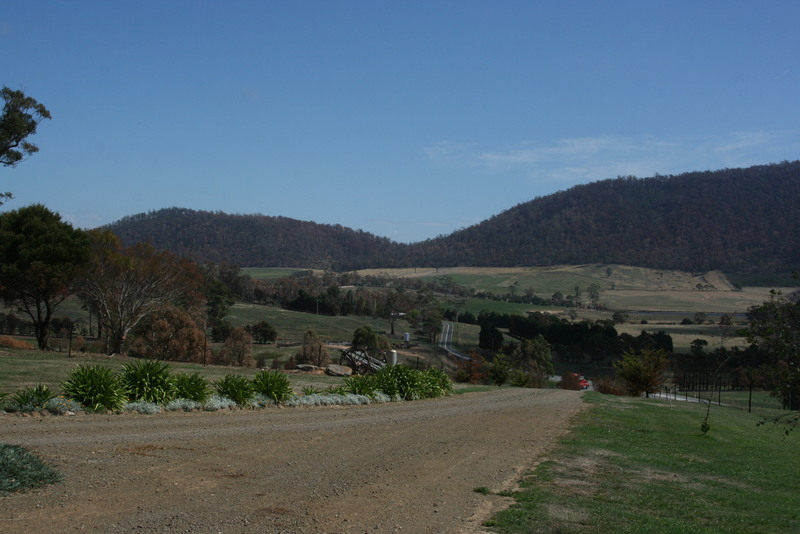 Looking south towards the land of George Frederick Brock Esq, on which resided convict James Milner – Carlton Parish, Tasmania. Yes, those are burned trees on the top of the hill from recent forest fires. James Milner was sent as a convict in March 1831 aboard the transport ship “Argyle” to Van Diemen’s Land, now Tasmania. I learned about this cousin from Roy Milner a fellow Milner researcher in England. I had verified the details about James Milner using the wonderful convict database at the Archives of Tasmania website. James was also located in the 1842 census as the head of the household, working as a servant on the land of Fred Brock Esq., located 6 miles from Carlton, in Carlton Parish. While on my lecture tour in Australia, I learned a lot about the life of convicts and their place in society by reading and visiting a number of prisons. Given the census information I had, I wanted to see if I could physically put James Milner on the ground somewhere in Tasmania. The first stop was the map collection at the Tasmania State library in Hobart where I hit pay dirt. With the help of staff, I located a map of Carlton Parish naming land owners. George Frederick Brock received a land grant of 2560 acres. This has to be Fred Brock, Esq. of the census. More research is needed on this person as he must be significant somehow, especially when one realizes that the largest land grant in Tasmania was 3,000 acres given to the governor, near Richmond. 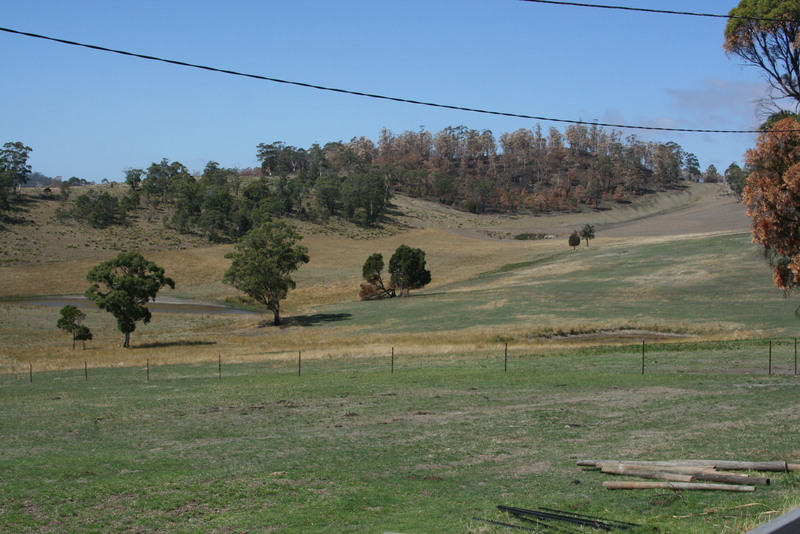 The Brock land abuts the small community of Copping on the modern road from Hobart to the penal settlement at Port Arthur. This property in many respects was in an ideal location as we had planned on visiting Port Arthur. We had seen advertisements for the Copping Colonial and Convict Museum so we drove to Copping. The name of the museum was a big misnomer and the owner had no information on even the major landowners in the area. We retraced our steps a little along the road until we found a farm track taking us up onto the top of the hill that would give us a great overview, looking South onto the Brock land (see picture). There was no one home at the farm, but I did take a bunch of photographs of the surrounding countryside. The census was taken January 3, 1842 at the height of the summer. I was there March 7, thus a little later in the Australian summer. The grass I saw was probably drier and browner, the creek was drier, but the rolling hills, with patches of woodland would have been just as beautiful. Google Earth shows that there are some vineyards or orchards over the crest of the hills to the south but they are not visible from the house where I stood. There was only one private road, heavily posted with keep out signs, and with lots of truck traffic that appeared to go a little further south onto the property, which had been identified as the municipal tip. We did not take the private road. I have James Milner on the ground in Carlton Parish, Tasmania. Now I need to find out more about George Frederick Brock, Esq. for whom he appears to be working. Ah! The joys of family research, always leading to more questions. We can’t get through the Irish celebrations of St. Patrick’s Day without a good Irish story. Here is an excellent article from the New York Times about the personal collection of a fishmonger from Ballina, County Mayo, Ireland that is being cataloged by Sinead McCoole. It’s a job where where she set aside six weeks to catalog and find the best for an exhibition. Now eight years later she is still working on what has become known as the Jackie Clarke Collection with more than a 100,000 items focusing on the retelling of Ireland’s long struggle to free itself of British rule. The collection includes “fragile maps and rare newspapers, political posters and editorial cartoons, books, diaries, photographs, films and even a scrapbook.” It’s an interesting story and worth a read. You never know what you might find in your Irish research. Thanks to Beth Finch McCarthy for bringing this to my attention. I have just returned from four weeks traveling and lecturing in Australia. I was the keynote speaker, giving fifteen lectures and participating in a panel at a genealogy conference on a 9 day cruise out of Sydney. I also gave 4 lectures in each of six cities: Hornsby (Sydney); Brisbane; Perth; Adelaide; Canberra and Melbourne. Everything was wonderfully arranged by Alan Phillips at Unlock the Past. In total, I presented 39 different lectures on 15 different aspects of British Isles research. Audience interest met and exceeded our expectations throughout the tour. During the conference, I was gratified to find that people kept coming to my lectures and in fact, began bringing their cruise companions along. During the cities tour, we exceeded attendance expectations, sometimes having double the numbers we expected. It goes without saying that I had to be well prepared to give 15 different lectures for the cruise, and ensuring that each one was chock full of information. In point of fact, I had to cut content to meet the 50 minute time limit of the format, since in the U.S. audiences expect a lecture of 60 to 75 minutes. Thank heaven for the power point changer with its built-in timer keeping me on schedule! Each city venue chose its own four lectures from the fifteen given on the cruise, often with very different subjects to appeal to a wide audience, rather than being chosen to form a cohesive package. Using power point slides meant that I could make adjustments to my presentations while traveling, and thus ensure that the lecture met the specific needs of each audience as we traveled from city to city. My goal was to make sure that everyone attending learned something new about how to do their own research, and that the beginners did not feel left in the dust. Feedback tells me we succeeded in meeting that goal. The lectures would not have been so successful without excellent physical arrangements, and for this we thank Unlock the Past. Venues varied greatly, but were often in clubs (rare to non-existent in the US), such a RSL (Returned Service League), Celtic , Irish, and Broncos (sports team). Major benefits of using the clubs were ample parking and on-site restaurants. Other sites included a town hall and (the best from the presenters’ perspective) the banked auditorium within the State Library of Western Australia. Events were set up with typical 9-4/5 schedule, but during the week in a 1-9 time slot so that folks could come without missing a whole day of work. Registrants could also choose between a full or half day of presentations, for further flexibility of participation. Mini lectures on Flip-Pal or Find My Past, given by Rosemary Kopittke, were scheduled in the middle of my four presentations. This was a very smart scheduling move, as it gave me a break. Then, while the audience members had their break, I was 100% focused on answering individual audience questions. And this brings me to my comments about the audiences I encountered. Their numbers varied from 80 to 150. Across the board, their base knowledge of general British history, geography and UK genealogical resources was generally far above what I would find in a typical US audience. Many more were themselves or had descended from recent immigrants; therefore, the likelihood that they had traveled extensively in the UK was also much higher than I encounter in the U.S. I also learned that the standard procedure in Australia is not to provide handouts at the event. I was concerned about this, because it is my practice to provide a content-rich handout so that participants can focus on the examples and do not need to take extensive notes in the lecture. But I found out that it worked well with such a sophisticated audience. I provided the handouts downloadable from this website after the lectures. Participants were eager for knowledge, case studies, and for resources. They participated actively in the discussions and in the profiling of their needs and interests that I conduct at the beginning of each session. I could readily see that they went away excited and eager to do more research. It was great fun and a real privilege to lecture to diverse audiences. My thanks to all! We also made some great new friends along the way. My recent visit to the Migration Museum in Adelaide helped me put part of my own life story in perspective. From its founding to 1982 Australia has been encouraging and often subsidizing emigrants from the British Isles, especially those with desirable job skills. In 1974 I was a beneficiary of one of these schemes. The Australian government had a program where British college students could be interviewed and apply for summer jobs in Australia. The government would find jobs for the students and then subsidize the flight to Australia. I did things a little differently. I found my own job in Australia. I then went for an interview, explained that I had found myself a job in my field, and asked if they would subsidize the flight to Australia. They were more than happy to. I thus became one of approximately 100 students who went to Australia for the English summer. I spent two months working underground on a copper and gold mine, working for Peko Mines in Tennant Creek, in the middle of the Northern Territories. I then spent a month touring around Australia learning about this large country. Visiting the Migration Museum made me appreciate that my journey to Australia, supported by the government, was one way in which they were still encouraging young adults with needed skills to immigrate to Australia.